How to Bypass Windows 7 Password? As we know, the one with administrator privileges can manage the passwords of all the users in Windows 7, and could be able to reset your Windows 7 password for your account. If there is other person who has account with administrator level access on your computer, just call him to change the password for you. It is very useful to change Windows 7 password by asking administrator to reset. But how should you do if the password you lost is the administrator one. We recommend Windows 7 Password Recovery to bypass Windows 7 Password without knowing administrator password. Step 1: Prepare one computer which can log onto Windows with a blank CD inserted in and launch Windows 7 Password Cracker. Step 2: Choose "reset Windows local account password". Step 3: Specify the device (here we tick "CD/DVD", and you can also select "USB Flash Drive" if you connected USB in the Step 1). Step 4: Click "burn" to start the bootable CD burning. Step 5: Insert this CD on the computer you can't access to and boot it from CD. 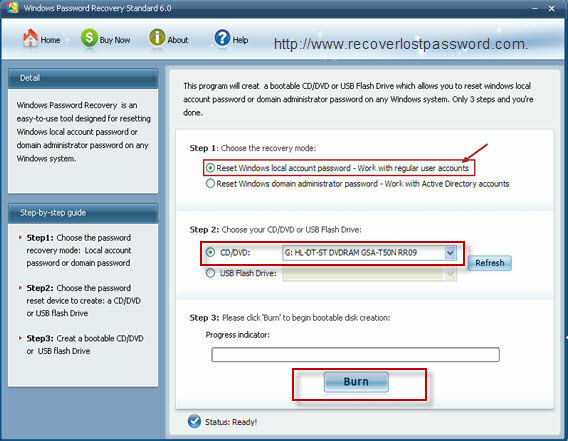 Step 6: You will enter the main interface of Windows 7 Password Recovery. Select the Windows installation and the user account you would like to reset password. Step 7: Follow the wizard to remove password or create a new password. Step 8: Reboot your PC to finish this password changing. In a conclusion, Windows 7 Password is by far the best software to bypass Windows 7 password.